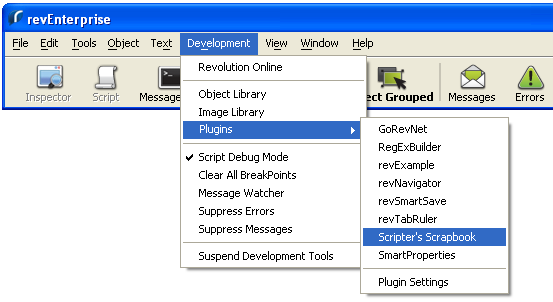 Place ssbk.rev (the scrapbook data file) and the ssbkPlugins folder in your plugins folder as shown above. 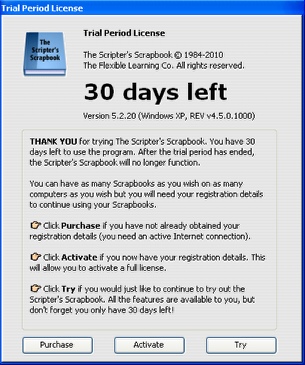 This will make your Scrapbook available from Revolution's plugins menu for easy access. If Revolution is running you may have to re-start it to update the Development:Plugins menu shown above. Select to open. Please read the agreement. You will also find a text file in the download. 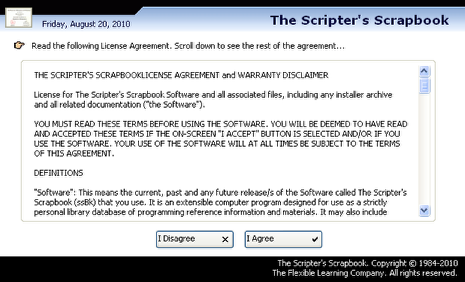 To use the Scripter's Scrapbook, your agreement to the terms is needed. You have 30 days free and unrestricted access with a Trial Period License to evaluate the program. To investigate the program for the first time, click Try. This screen provides quick access to all the main features of the system. You can return to this screen at any time from the Scrapbook by clicking the Home button shown in the next image. For now, just note that there are many additional features from on-line publication to chat, including a hot-link to report problems, check for updates, build plugins, save backup archives, and editing the Language and Category options you want. Click the first option at the top to open the Scrapbook as highlighted above. 1. 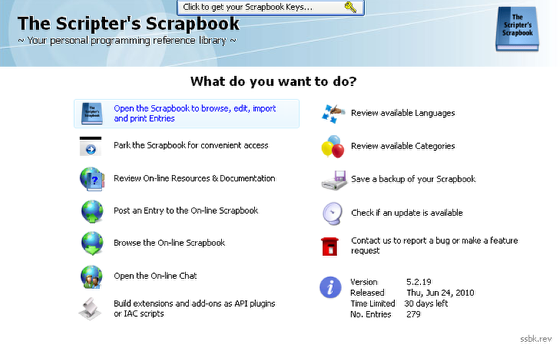 The toolbar at the top provides access back to the Home page, the Support documentation, and the Preferences to set up how you want your Scrapbook to look and behave. All the other buttons are customisable... Right-click to see the options. 2. The index on the left lists the selected Entries. Use the View dropdown menu to choose which index you would like or right-click to make a selection. 3. The Entry itself is on the right. Try this: Use the vertical and horizontal panel re-sizers to adjust display. Try this: Use the Display button to toggle between index view and full page display. Try this: Use the Park button to minimize the window to a draggable, translucent 'gadget'. Click again to restore. The more you try, the more you will find. 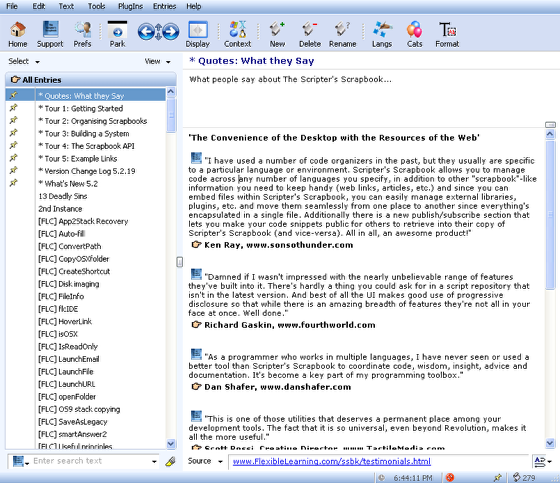 From searching and text colorization, to defining your own language and category classifications. The contents are only samples. Feel free to delete as many or as few as you wish before adding your own, attaching hyperlinks, embedding files and setting up multiple scrapbooks. The Support button should indicate the features you are looking for and answer most of the basic questions. There are also 5 bookmarked Tours in the index which will help you to quickly get more out of the program.